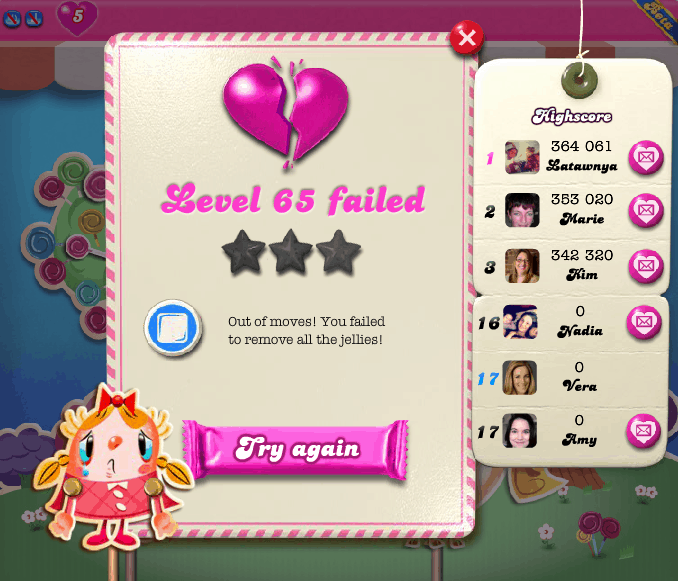 Lady and the Blog → Living → technology → How Do You Beat Level 65 On Candy Crush Saga? How Do You Beat Level 65 On Candy Crush Saga? Do you play Candy Crush Saga? I started a few weeks ago because my cousin plays and I kept getting her updates all over my Facebook feed. Well, NATURALLY I got addicted because I am an extremist and am now on Level 65. Level 65 on Candy Crush is notorious for being insanely difficult. Ok, difficult is an understatement. Level 65 of Candy Crush is IMPOSSIBLE. I’ve been playing it for… a VERY LONG TIME. I ZIPPED through the rest of the game…. but this damn level is going to be the end of me. Do you play Candy Crush Saga? How do you beat level 65? Is there some sort of secret? I actually posted the question of Facebook and SO MANY OF FRIENDS stopped playing the game because of level 65. It’s that hard. UGH. If you’re currently playing candy crush on your phone, try playing it on a desktop. It automatically gives you 5 extra lives and bonus candy to help beat your levels. I was shocked on how easy it was to pass the when I learned the trick. Good luck!! I’m also stuck for weeks at level 65, and I also got through the other levels pretty quick. It’s driving me crazy!! I just beat level 65 again while waiting to unlock the next levels just for something to do. It’s really easy if you can combine a color bomb with a striped candy. Make sure that there are many other pieces on the board that are the same color as the striped candy you combine it because it will turn all of those into striped candies too. Candy Crush hacks are how I have become better.